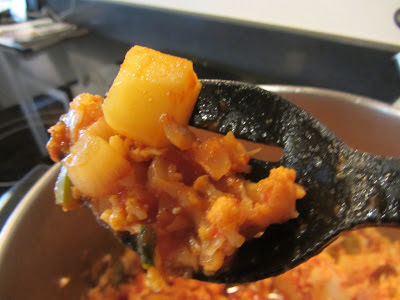 Louise at Months of Edible Celebrations has come back to blogging and is organizing her popular picnic game where at least 26 bloggers create an alphabetical picnic menu, beginning here with A for Aloo Gobi. On July 1, she will post a list of all 26 dishes, with photos! Actually, I really did bring real, not virtual aloo gobi on a picnic while I was in Aspen recently; I shared it with one of the Tuesday night barbecues at the Aspen Center for Physics. It's a good dish for a picnic because it's supposed to be served at room temperature. I first became aware of this delicious dish around 4 years ago when I saw the film "Bend it Like Beckham." As I wrote in an earlier post about this dish, the heroine of the film wants to be a soccer player, and is very good at it, but her parents believe that it's better to make good aloo gobi than to "bend it like Beckham" -- another concept, this from soccer, that I learned from the film. The line is pretty memorable, but what's very memorable is the DVD extra of the film director, Gurinder Chadha, in the kitchen with her mother and her aunties, who watch and give advice while she's trying to explain to her audience how to make aloo gobi. This extra feature is fabulous, maybe better than the film itself. We had a great meal including the above dish a couple of years ago with our friends Rashmi and Kappu. Kappu sent me her aloo-gobi recipe that I followed last month. I didn't have the turmeric and paprika, but I did have all the fresh spices, cumin, and garam masala, a delicious Indian spice blend that's also good on other things. 1/2 bunch fresh cilantro – leaves chopped and set aside separately. 3 medium potatoes – peeled and cut into 1” cubes. Heat oil in dutch oven, or large pan with cover, over med- high heat. Add onion and stir till translucent. Add cumin seeds. Cook until onions are light brown – do not burn them. Stir. Add turmeric, paprika and salt; stir. Add chillis, tomatoes, garlic, ginger, potatoes & cauliflower and mix till everything is well coated. Add 2+ T water, stir and cover. 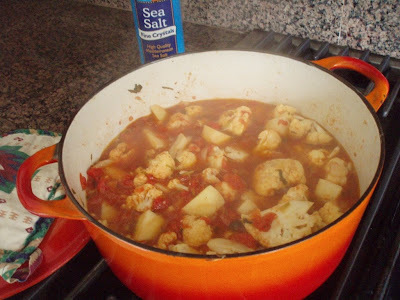 Reduce heat to medium low and let simmer for 20 minutes until the cauliflower is cooked. Stir and add Garam Masala, stir again. Sprinkle 1 T of unsalted butter or ghee, and cilantro leaves on top of the curry, cover and turn heat off. Let it sit for as long as possible before serving – up to 15 min. p.s. Do not cook after adding the garam masala. Just wait until you see the baskets of goodies we are going to have. Pretty amazing actually! I do hope you will be home from abroad for the Round-Up Mae, but I also hope you are having a GREAT time! I think this is more like our vegetarian curry. This is sure yummy. See you at the picnic! Another healthy dish for the picnic--how exciting! Maybe I won't have to diet afterwards this year. Oh wait, I'm sure I'll eat too much anyway. Can't wait to try this! Oh, this looks fab.. I can make this now and take on the picnic!! Found you through Yummy Chunklet's blog and I had to come over and check out your aloo gobi recipe. I am a huge fan! Looks delicious. 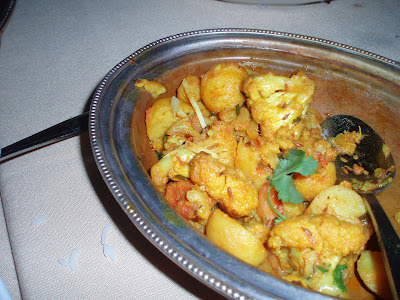 Aloo Gobi is one of my favourites! And these looks delicious! I adore Indian cuisine, and I shall be popping in at your corner come picnic day! I'm glad to see I'm not the only one who has never tried this dish. It looks wonderful!